The first time I got a real look at Maddie, the medicines being pumped into her had swollen her body and stretched her skin to its limit. I didn’t know her eyes were blue for two weeks because they were swollen shut. The tape that held her ventilator in place covered her face. The tubes were everywhere. She had a PICC line in her right arm, an IV in her left arm, an umbilical line, a forehead IV, and three chest tubes. Punctures in my brand new baby’s skin. Punctures in my heart. I’d never heard of chest tubes before Maddie. Basically, it’s a tube that goes directly into the chest to help remove excess air. Maddie needed chest tubes because the ventilator she was on kept popping holes in her tiny, weak lungs. Air would seep through these holes into the pleural cavity, or the area between her lungs and chest wall. That air would prevent her lungs from expanding, making it impossible for her to breathe. From all my reading, chest tubes are extremely painful – not only the inserting, but also the removing. Maddie had five chest tubes at one point, and when one would stop working, it would be moved. She has a roadmap of scars all over the right side of her chest. Scars all over my heart. Maddie’s umbilical line only lasted about ten days, so after that when the doctors needed blood – always daily, sometimes multiple times per day – the nurses would prick her heel to draw it. Maddie had so many heel sticks that toward the end of her stay in the NICU, she would sleep through them. After one of her IVs became infected, the nurses would only insert an IV when abolutely necessary – for a medicine that couldn’t go through her PICC line, or for a blood transfusion. She’d sleep through those insertions, too. My heart felt the pain her skin had grown accustomed to. Every new baby gets vaccines, that’s nothing new. Maddie had to get an extra vaccine every month to help prevent RSV. That’s six extra shots in her chubby little thighs. Both times she’s been re-hospitalized, she’s had IVs and blood draws and heel sticks. Her last few illnesses have required blood tests. Her cystic fibrosis studies needed blood. Now that she’s older, she doesn’t sleep through the needles. She always cries out, but then she gets quiet and waits for the blood draw/shot/medicine to be through. So little, but so brave. It makes my heart break. One of Maddie’s NICU nurses once told us that while Maddie would never remember her hospital time or the pain, Mike and I always would. The pain of her pain will never leave me. When my shoulder hurts or my c-section incision is bothering me, I just have to remember what my little baby went through to keep the complaint from passing my lips. I thank God every night that Maddie will never remember the difficulties she faced in her first year of life. If I thought for one second that she would…well, I don’t know what I would do. I’ve thought a lot about the physical scars on her chest, the scars that she will surely notice and ask me about. Scars that will show when she’s old enough to wear a bikini. A chest tube went directly through her right breast tissue, so there may be some growth issues there when she starts to develop. Right now, I call the marks her kissing spots. When I’m dressing her in the morning, I kiss each spot on her chest until she shrieks with laughter. If I could remove any reminder of her difficult start, I would, but since I cannot, instead I will teach her to celebrate them, cherish them. They are marks of life. So far in her eight months, Mike and I have counted one hundred fifty three shots/IVs/sticks/pricks/tubes/holes in Maddie’s skin. Life-saving holes. Each hole in her skin is a hole in my heart I will carry with me until the end. Run, Fat Boy, Run!Run, Fat Boy, Run! she is adorable…and you sound like such a terrific mommy. jens last blog post..apple juice and cookies – stat! Oh, I know what you mean. And I mean I DO know what you mean. That pain is indescribable and my heart breaks for Maddie and you who have cried for each of her hurts. It’s a hard road being the parent of a sick child, but God gives you the strength to be just the mother she needs. Those moments when you kiss the scars are healing her with love, and healing you as well. I’ll be praying for that beautiful, foot-eating baby girl of yours and for you too. Near tears here. I can’t imagine how hard that was for you and Mike. 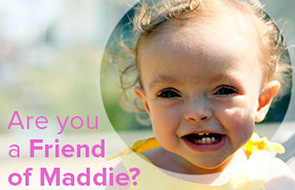 You’re right, Maddie is one of the bravest little babies out there. If anyone has a chance, it’s her. The day I first saw the PICC scar in Erin’s leg (at first she was too small for it to be visible) I cried all day. It took an hour an a half to place. The little scars all over her tummy from where her skin tore in her first weeks. I haven’t had the heart to count her scars. I can’t imagine what she and Maddie went through, but you’re right they’re like little holes in my heart too. This is a very sweet and warm post. Little Maddie is so very strong, although I’m sure she takes her cues from her loving parents. God, Heather, it’s not nice to make me cry right before bed. All you would ever need to do is show her this post, and she will know not only how much you and Mike love her, but how deep those scars go in your heart. I would endure anything and everything to keep Abbie from hurting. We have been so lucky to never have to see anything worse than an allergy or nurse maid’s elbow. All our prayers and good thoughts are with the three of you. The three of you have been brave together. I can hardly imagine what this has been like for you. I cry when my babies have their immunisations. Wah! That little kid is so loved. moosh in indy.s last blog post..mooshisms. Whew. That was hard to read. What a fabulous tribute to your sweet girl. mwaah- that’s a kiss for maddie- and for you! those pricks… the tubes….i cant relive it. we took our video camera to the nicu with us.. so we have a lot of footage of the girls, but i cant look at it. I just cant yet. Oh, what an ordeal you’ve all been through! She is a little fighter for sure–and so beautiful! You are all very strong!! “…instead I will teach her to celebrate them, cherish them. They are marks of life.” Those are really beautiful words. That little girl of yours is going to shine in this life! Christys last blog post..The Real Me? way to kill me this morning. This is a beautiful and touching tribute to the trials of brave little Maddie. Not to mention her supermom! Someday you will hold her on your lap and tell her the tales of her early days and she will be proud of her “kissing spots” because they are proof she fought the good fight and WON! I can’t even imagine the pain all three of you have endured. “Kissing spots” – that is beautiful! I feel so sorry about your situation! God knows what he´s doing. Hopefully it will turn out well! It’s so crazy to have 3 heros that you feel like you know but you’ve never even met. I meandered over here from either Becky’s or Niobe’s blog – my children are grown or almost grown now since I am, as my sons delight in telling me, old. I am commenting to share a perspective from my advanced years, especially since I noticed your mention of cystic fibrosis. Life moves fast, especially for those with health crises, and I suspect you wonder in the midst of it if all you go through, that the pain you willingly endure, is worth all the pain your tiny infant goes through to stay alive. This past weekend my oldest son’s best friend Matt got married (my son was best man). It is not unusual for a 30 year old to get married but for Matt’s mom, it was nothing short of a miracle. Matt has struggled through a lifetime of cystic fibrosis, associated health challenges and warnings to his mom that he wouldn’t live to age ___ (starting in infancy). But he did live – through painful treatments and dark nights of the soul. Saturday when he married his love, Matt, his bride and his mother radiated unbelievable joy from the depths of their beings. For his mom, for Matt, those depths were plumbed by pain and suffering, but having been so low, the joy they felt was that much sweeter. Your post moved me to tears; especially the healing gift of your transmuting your daughter’s scars to love. I read your story and I think Maddie is blessed to have you both as parents. I’ve always wondered how you (and all of you) make it through that time. I know that you soldier on because that’s just what one does, but I wonder if I’d be strong and brave enough to make it. You three–and the multitude of others like you–are amazing. Just amazing. I cried during Simon’s first two vaccinations. I cannot imagine going through what you and Mike have gone through. The only time Simon had blood drawn was after his peanut reaction when they needed to do a full workup to see if he had any further allergies. The nurse had me restrain him with my arms around him and one hand pinning down his skinny little arm. He was about 19-months-old at the time. Even that passed relatively quickly and left no marks. Maddie’s kissing spots ARE beautiful and I hope they’ll remain a beautiful testament to how much her parents love her and how so many people’s lives came together to save hers. This morning at work, our maintenance guy hear us talking about putting together a group to go play with siblings at the Ronald McDonald house here at our local children’s hospital. He got choked up and told us his son had 50 surgeries before he could leave the hospital, and that his niece had weighed less than a pound at birth and was now a healthy teenager. It blows me away how many parents survive such overwhelming trials when their children are so tiny and vulnerable. No matter WHAT I’ve been through in my life, nothing compares to watching my child suffer, and being powerless to help ease the pain. Maddie is so brave, and such an inspiration! So that made me tear up. Heather you are a great mom! Call me later let’s get lunch this week. There’s nothing left to say that hasn’t already been said more eloquently above, but that was a beautiful post. If Maddie’s anything like you (and I think she is) then she WILL wear those scars like badges of honor – I can’t wait to watch her get older. She’s gonna do something kickass with her life for sure. Maddie is so lucky to have you and Mike as her parents. I thought it was horrible when Meg was tested for allergies and had all those needles. Hard to be brave when you feel to sad inside for your child. Poor little girl! That makes my heart break. I agree with Danes. Everything has been said. But I’ll bet that those scars which seem so large now will be so tiny by the time she is ready for a bikini. Y’all are brave. Your beautiful girl is brave. You are testaments to the spirit which we cannot see but which lives in all of us. You KNOW how strong that spirit is. Maddie’s a lucky little girl to have you guys. Love you all. Bless that sweet baby…My nephew had Leukemia and went through all that awful stuff. It does break your heart. I cannot imagine having to go through that with my child. Teaching her to celebrate her body as the miracle that it is, is a wonderful tribute to her strength even when she was so very tiny! This is a great post, heartbreaking, but great. I’m sorry that you and Maddie have been through all of this. We kind of bonded way back because you were one of the few people who understood how much pain I was in when Faith was sick – and it was nothing like this so I can’t imagine. The two of you will share a bond like no other mother/daughter and your strength is already evident. Hugs to you both. I just wanted to say that what you said was beautiful. And that hopefully her scars will be like my college roommates- she had heart surgery when she was a newborn and now her scars consist of a tiny check mark (she calls it a nike swoosh) and a tiny tiny line… and they’re on her back so nobody ever notices them. Something about how the skin moves/expands made them go from her chest to her back so maybe that will happen with Maddie. You brought tears to my eyes….beautifully put. And now I’m sobbing at work. Jesus – now I’m crying at work too- good thing I work alone!! Frick! That little girl of yours is precious and so brave and so are you and Mike. I can’t even imagine what it was like for you, Mike, or Maddie but thank you for sharing your journey. That was beautifully written… and made me bawl. I’m glad she is doing well now. Oh goodness… what a precious girl, and what a hearbreaking story. I don’t believe it will ever be less hurtful over time, but I hope that your family is always healthy and sound from this point forward. Best wishes to all of you.. and I’d just like to say that I am amazed by your strength, your courage, and also that of your family. Truly sobering – and it puts a whole different take on my frustrating day with my toddler. Thank you for sharing. Beautifully written. I have a daughter myself and cannot imagine going through that kind of ordeal. It is my worst fear. The photo is so beautiful. Thanks for sharing that. It’s funny.. I’ve never taken the time to think about this question because no one’s ever asked- isn’t it funny how much we overlook when our kids are sitting on the precipice of life? The things that stand out in my memory of my son’s NICU experience is the most dramatic- I was unable to hold him, even touch him, until he was almost 3 days old. I wonder if that almost caused a disconnect in me because I’ve had a much harder time bonding with him then I had my daughter (I hate to even admit that) I know that the nurses full focus was on him and how to get him better, but thinking back, it would have been nice to have had someone there as my advocate too- as a parent and someone who had no idea what was going on. Not to be selfish, but just someone who could take the time to explain to me EXACTLY what was happening so I didn’t feel so lost and alone. Thankfully my sister’s a nurse and could decipher a lot of what we were being told, but most people don’t even have that. It would have been nice to have someone there to check in on my husband and I, to keep an eye on our son and let us know at the earliest possible time, when would be safe to have held him. I know I’m not a medical professional, but I felt as though we were almost overlooked in terms of being able to touch him and be close to him, and though I understood their need to stabilize him, I felt like there were many opportunities we could have had to be close to him- to touch his skin and speak softly in his ear, where we weren’t allowed to. And I’m not speaking badly of the NICU we were at, they were as caring and empathetic as they could possibly be with so many sick babies to care for… but I agree completely and totally that a parent advocate would be a great thing as well. One thing the NICU did that thrilled me- they gave us a blanket that was knitted by a local nursing home for the sick babies, and let me sleep with it- all curled up next to me, as though it were him, and after a few nights of sleeping with it, the NICU allowed me to put it next to him in his bed. If I couldn’t be there sleeping next to him, at least something that had been close to me, could. We actually still have that blanket, and I can’t look at it without tearing up. I’m beyond thankful that he’s healthy today, but I don’t think any of us go into this ride (pregnancy, birth, children) expecting anything like this to happen. So I can completely understand how PTSD would be a byproduct of all of the trauma. I could sit here and tell you how strong and amazing I think you are, but I’d venture to guess that you probably don’t feel strong and amazing. But you are, Heather- you truly, truly are. I’ve been reading your blog since Maddie passed, and my biggest regret is not having found it sooner. Thank you Heather- and peace be with you, hon.